Kimberly graduated from the Professional Welder program at Tulsa Welding School, Jacksonville campus, in July 2016. Kimberly is a Veteran. She served in the Army National Guard for six years, enlisting at 21. After high school, before enlisting in the Army, Kimberly tried college for a while, but it didn’t work out. While in the military Kimberly suffered a head injury in an accident. It took a lot of therapy to recover, and although her long term memory is still affected, it didn’t hinder her military career. In fact just six months after the accident, she was deployed to Iraq. 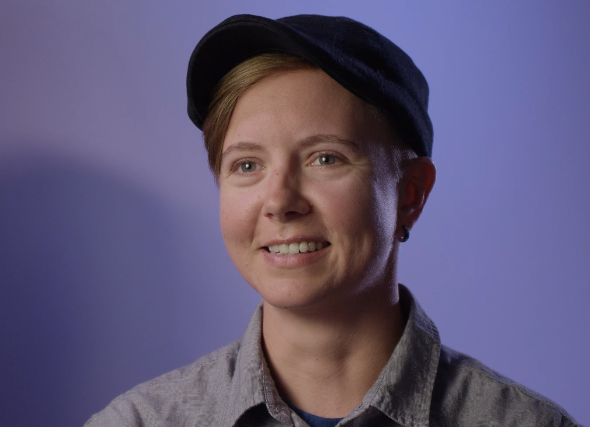 Once she got out of the Army and started transitioning into civilian life, Kimberly started working maintenance at a local facility in Jacksonville, FL. She saw ads and commercials for Tulsa Welding School. Being from Jacksonville she always knew the campus was in town. Kimberly grew up around welding, although she’d never picked up a welding torch herself. Before she took the school tour, Kimberly had seen a 9/11 memorial that really inspired her. Welding art is a real interest for Kimberly. After her stint at college, and then her time in the military, Kimberly knew she wanted to work with her hands. Once you start classes at Tulsa Welding School, you get right to it. For someone like Kimberly who prefers hands-on training to learning in a classroom, Tulsa was a great learning environment. Kimberly’s advice for those considering welding as a career and coming to Tulsa Welding School to learn the trade is set your own goals before you enroll. Kimberly does want travel, see a lot of different places, and work on all different types of welding jobs. Does Being a Woman Make a Difference? Coming from the military, Kimberly says she’s used to being a “minority.” She doesn’t see any differences between being a male and a female welder- although that may not be the case for everyone. Don’t Hesitate! It’s a Great Opportunity! Kimberly advises women who may be hesitant about coming to welding school, don’t hesitate… Why? Because there are lots of opportunities for women in welding. “I definitely recommend welding as a career for a woman. Personally, I like the diversity of being a woman who welds. I’ve been told that women make better TIG welders because their hands are a lot more steady! You’ve got to be really steady with both your hands, and patient – patience is a virtue!